Samuel Bronshtein was born March 26, 1908 in Bessarabia which at the time of his birth was part of the "Principality of Moldavia". In 1908 Moldavia contained Walachia associated in history with Vlad the Third, or to those loving English literature "Vlad the Impaler". Who ruled the area with the title of "Dracul" aka: "Dracula". Adding a little more interesting history in 1917 during the Russian Revolution this area became for a short time the "Moldavia Democratic Republic" Connecting the young Bronshtein closer to that revolution was his Uncle Leon Trotsky. Who along with Vladimir Lenin were the principles involved in overthrowing Czar Nicholas, Trotsky's birth name was Lev Davidovich Bronstein. At an early age Samuel Bronston's family moved to France. Where the young man eventually attended the Sorbonne, It was during this period that he became interested in photography and motion pictures. While in France Bronston started working for the French Unit of Metro-Goldwyn-Mayer. During 1937 at the age of 29 Samuel moved to the United States and would became a production executive for "King" Harry Cohan's Columbia Pictures. Rumor has it that the reason Samuel Bronson actually left France was that the courts gave him three choices: 1. Pay his creditors which he had no money to do. 2. Go to jail over the charges leveled at him, or 3. Leave the country. "City Without Men" was also the last time Samuel Bronston worked for Columbia Pictures. At this time the 35 year old Samuel Bronson decided to form his own production company "Samuel Bronson Productions". For his company's first film the newly created independent producer returned to Jack London. The motion picture was supposedly an "accurate" biography of the writer. "Jack London" starring Michael O'Shea and Susan Hayward distributed through United Artists on December 23, 1943. The "accurate" story was changed to include a large portion of anti-Japanese propaganda for the World War 2 audience. See the second poster for the film below. It is important to note that London died on November 22, 1916. His contact with Japan and its military was as a war correspondent during the 1904 Russo-Japanese War. He was arrested by Japanese authorities, but immediately released after the local American Ambassador intervened. Two years later on December 3, 1945 a classic World War 2 drama "A Walk in the Sun" was released. Initially actor Burgess Meredith, who became the movies narrator, originally approached his friend Samuel Bronston to produce a film version of the novel by Harry Brown. As production started Bronston was forced to shut down due to problems with his creditors. The movie was completed by Superior Production without any on screen credit to him, but Bronston sued and received an out of court settlement of 21.25 percent. ...when the Knights of Columbus planned an ambitious project to photograph the wonders of the Vatican, Bronston was there to take them up on their offer and commit to a thirty film series. Granted unprecedented access to the considerable archives of the Catholic diocese, Bronston arrived at the Sistine Chapel with a veritable army of crew and photographic supplies. Unfortunately, the intense heat generated from the enormous lights caused a minor fire in the famed chapel and a major scandal that succinctly ended the project on a decidedly sour note. With one ill timed event, Bronston had effectively managed to alienate the Catholic Church and burn his bridges in Hollywood. It would be 14 years after "A Walk in the Sun" before the name Samuel Bronston was seen on a commercial feature film. By the mid-1950's the old "Hollywood Studio System" was almost gone as television took over the need for American families looking for entertainment. No matter the weather television was in American living rooms and once a family bought a set. It was free. There was no need to go out to the movies anymore. Upstart studios like American International Pictures were taking aim at the one group still faithfully going to the movies. This demographic was made up of teen and pre-teen audiences. Who basically were going to Drive-In's to see titles such as "I Was A Teenage Werewolf" and "I Was A Teenage Frankenstein". Columbia Pictures a member of that old "Studio System" adapted to the change somewhat with titles such as "Earth vs the Flying Saucers" and "The Giant Claw". While small studios like Allied Artists, the one time Monogram Pictures, became distributors of independent pictures such as 1959's "House on Haunted Hill", "The Tingler" and other titles by producer/director William Castle an old Columbia Picture contract director. One other old studio was surviving and that was Universal who started renting space to television companies to film their product. Times had changed. In 1958 Samuel Bronston seeing no need to return to the United States, but being a promoter saw other opportunities. He set up a studio in Madrid, Spain with the idea of offering to both the major studios and independent producers a location to shoot motion pictures which greatly cut their production costs by using Spanish crews and actors. Bronston would become an executive producer on several films for a cut of the profits. The studio he took over went back to the 1930's and was "Estudios de Chamartin" which became known simple as "The Samuel Bronston Studios". Promoter Bronston next got the idea of producing historical big screen spectacle motion pictures with all star casts to lure audiences in the United States back into the theaters. The first Madrid made motion picture became the prototype. 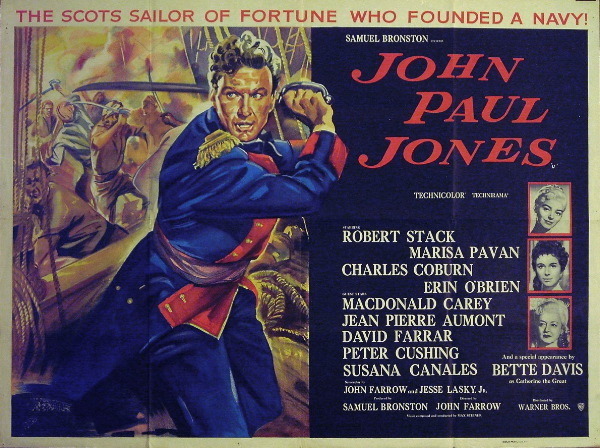 Released June 16, 1959 the feature starred actor Robert Stack as "John Paul Jones". The motion picture covered the life of "John Paul Jones" from age 17 through his death, Samuel Bronston made only one casting mistake and it was unfortunately a big one. He miscast Robert Stack in the title role. Stack played the founder of America's Navy without any real emotion. Perhaps the actor had confused the Scotsmen with Elliot Ness. A part Stack's stoic acting would work better upon four months later when the television series "The Untouchables" premiered. The critics zeroed in on Robert Stack's lack luster performance and with the all star international cast he worked with. That performance effected the entire film. From an historical perspective the motion picture covered the events in Jones' life very well and had rich production values, but it's two hour and six minute length at times seems to be twice as long. However, as I said even with it's flaws the film became Samuel Bronston's prototype for what was to follow. For his next motion picture the producer decided to remake a classic 1927 silent by Cecil B. DeMille about the life of Jesus "King of Kings". 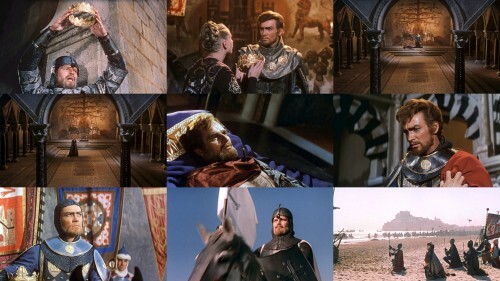 The subject matter of the film was a perfect choice as three years earlier American's and Foreign movie goers had paid the higher priced Reserve Seating for what became a 12 Academy Award nominated religious feature "Ben Hur" with a 212 minute running time starring Charlton Heston and Stephen Boyd, Of the 12 nominations the film won 11. "Ben Hur" was produced by MGM and it was to that studio that Samuel Bronston turned to distribute his production, Which would be released on October 11, 1961. The script was written by Philip Yordon and a non-screen credited Ray Bradbury. The film was narrated by Orson Wells and starred Jeffrey Hunter as Jesus and Robert Ryan as John the Baptist. It was the first motion picture to address the life of Jesus from his birth and under director Nicholas Ray. "Rebel Without A Cause" and many other excellent motion pictures, Both the large spectacle sequences and the more mundane family life are perfectly presented. This version of the life of Jesus takes license with the facts to make a more exciting motion picture, Two examples changed give Barabbas a purpose for being a Roman captive by turning the thief into a Jewish rebel leader. Salome is presented as a promiscuous teenage girl out to seduce John the Baptist. With this picture Samuel Bronston took aim at those Reserve Seat prices and special showings. Theaters such as the original Egyptian in Hollywood showed the feature in the new 70mm Super Technirama Process on a screen only Cinerama remained larger. The running time of the picture was 168 minutes plus a 15 minute intermission. The budget was $5,037,00 and the initial box office was $13,400,00. Samuel Bronston had his first real hit. One of the more interesting controversies about this portrayal of the life of Jesus came from "The Christian Science Monitor", It's reviewer said Jeffrey Hunter was too young to play the role. In fact the reviewer re-named "King of Kings" as "I Was A Teenage Jesus". MGM pointed out that the historical Jesus was supposedly 33 years of age at the time of his death. The same age of Jeffrey Hunter. 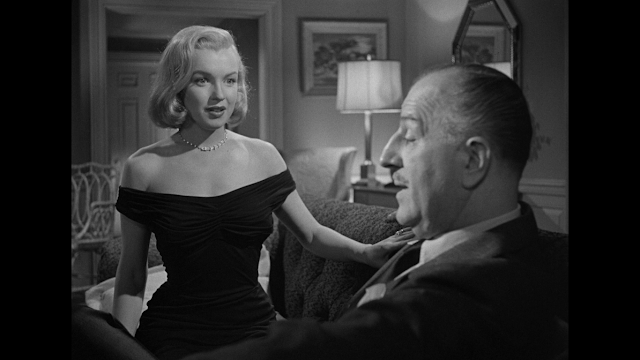 Bronston had a second epic being filmed at his Madrid studio's that was released two months later on December 14, 1961. This was the story of the Castilian Knight Don Rodrigo Diaz de Vivar known as "El Cid". Who drove the Moors out of Spain. The motion picture was the first of two appearances by both Charlton Heston and Sophia Loren for Samuel Bronston. It was directed by Anthony Mann who like Nicholas Ray would make two pictures for the producer.. This spectacle was made long before computers entered the era of motion pictures and CGI replaced the need for massive sets and as the quote goes "A Cast of Thousands". The film employed 7,000 extras for the battle scenes and used 10,000 costumes. The budget was $6,200,000 and the initial Box Office in the United States alone was 30 million dollars. The film's running time was 184 minutes plus intermission. Like Bronston's "King of Kings" "El Cid" was not without controversy and it came from Sophia Loren and a New York Marquee on the Warner Theater. Here is a quote from the website "Leagle" about a case known as "Loren vs Bronston Productions". Sophia Loren plays the leading female role of Chimene in "El Cid"; the part of "El Cid", a national hero of Spain, is taken by Charlton Heston. The plaintiffs' asserted grievance is that Miss Loren has not received the billing to which a written agreement of October 14, 1960, entitles her. This agreement provides that in all paid advertising of "El Cid" Miss Loren is to be accorded "second (2nd) star billing above the title, 100% the size and type of the title, on the same line, same size, same prominence as that used for Charlton Heston, who received first (1st) star billing." The plaintiffs complain of noncompliance with the foregoing provisions, especially in the design of electrically illuminated upright signs, on which the name of Sophia Loren appears below that of Charlton Heston, and the type of their names is different and smaller than that of the title "El Cid". The names of the two top stars on these signs, are, however, in the same size type and there is no differentiation in prominence, except insofar as the position of one above the other may imply. Moreover, on the marquee in front of the Warner Theatre facing Broadway their names are on the same line. The defendants dispute that they are doing anything in derogation of the plaintiffs' rights; they rely on the billing clause of a later employment agreement fully complied with, which, they say, either binds the plaintiffs contractually or which, in the light of their conduct, equity and good conscience will not permit the plaintiffs now to disavow. He also led the 1997 restoration of the motion picture. Two years later in 1963 Charlton Heston was back in a Bronston production. 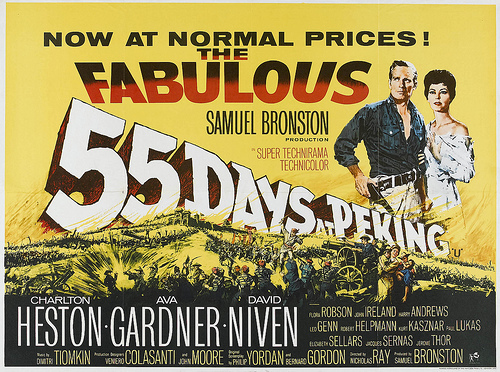 "55 Days at Peking" co-starred David Niven and Ava Gardner and featured an all star international cast. The picture was based upon an incident during the 1898-1900 "Boxer" Rebellion in China concerning the siege of the Foreign Embassy Compound. This was Nicholas Ray's second film for Bronston and although the action scenes are outstanding the script and love story between Heston and Gardner is distracting and slow in a 153 minute long motion picture. The two would play opposite each other in 1974's "Earthquake: as an unbelievable married couple once more prisoners on a terrible script. The film was a commercial failure. It had a 17 million dollar budget which included building a set that in detail reflected Peking and the Foreign Compound. However, the motion picture only grossed 10 million dollars domestically. Foreign grosses are still over looked which might have made the picture's budget at the time, but still no profit. The following poster illustrates both the difference from Reserve Seat "Road Show" prices and those for General Release at the time. Also note the wording as it applied to this particular motion picture which upon its General Release was already showing Box Office failure compared to Bronston's other two features from 1961. A major problem with the film was the casting of the Chinese roles. All the major parts were played by White actors. Another problem for Samuel Bronston and its distributor Allied Artists was the attitude toward the Chinese. The picture does did not reflect the period of the story, but racial views and feelings of 1963 America toward Asians as a result of the Vietnam War's escalation. 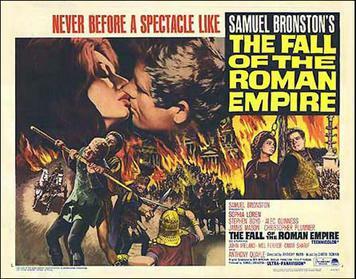 With the financial costs of running his Madrid Studio Samuel Bronston was heading in the wrong direction and this came to a head with his next star studded epic "The Fall of the Roman Empire" released March 26, 1964. Why after the failure of the 17 million dollar "55 Days at Peking" Bronstein continued with his 19 million dollar epic of the last days of the Roman Empire is debatable. Especially when one looks at the initial casting problems. Originally Charlton Heston was to play the Roman Centurion Livius,. but turned it down when he discovered Sofia Loren was now to play opposite him. The two had ego problems on "El Cid". 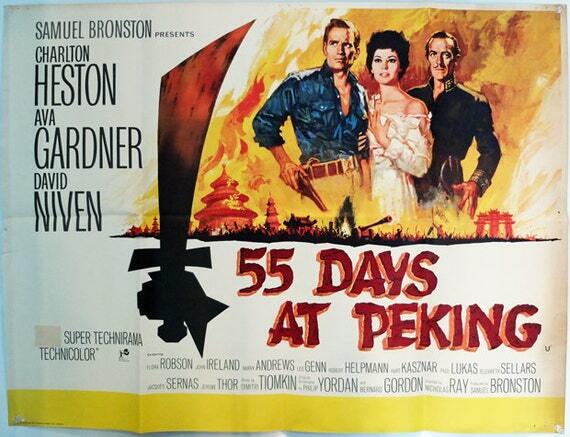 Heston went on to make "55 Days at Peking" instead. Kirk Douglas also turned down the part and it finally went to Stephen Boyd. Sophia Loren as Lucilla was also not Samuel Bronston's first choice. 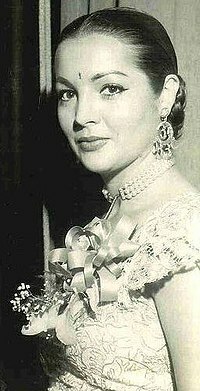 The original plan was to have Mexican born Spanish actress Sara Montiel in the role. She turned it down and Bronston turned to Loren which led to Heston not wanting the male lead after committing to the project. Sophia Loren would be the highest paid actor for "The Fall of the Roman Empire" with a salary of one million 1964 dollars. Which in 2016 dollars would be $7,681,677 a very large sum for the time. One has to wonder how much her hairdresser's weekly salary was? Originally Richard Harris was to play Commodus, but he left and was replaced by Christopher Plummer. There was no casting problems with Sir Alec Guinness as Marcus Aurelius. Harris would play that role in Ridley Scott's 2000 remake "Gladiator". More on that film shortly. The basic plot for "The Fall of the Roman Empire" has Livius as an honored Roman commander and friend of Marcus Aurelius' son Commodus. He is in love with his friend's sister Lucilla. Both Lucilla and Marcus Aurelius envision Livius as possibly the next Emperor, but before their plans can be put forth. Commodus has his father murdered and becomes Emperor starting the decline of the empire. Livius becomes at odds with Commodus and eventually the Emperor has both Livius and his sister tied to a stake to be burned. The army rebels, Commodus is killed and the army wants Livius to become Emperor. 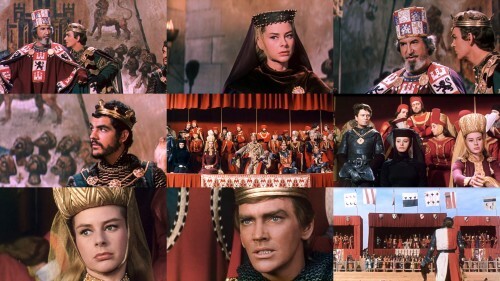 He refuses and the film ends with a bidding starting for the crown of Rome. As with all three Samuel Bronson Epics to date there was the popular Dell Comic book version. Once more example to illustrate the difference between the CGI created imagery of today and how a motion pictures was made at the time. The 1312 by 754 foot Roman Forum set still holds the record as the largest set ever made. The battle of the four armies required 8,000 extras all in full costume including 1,200 Calvary. On the flip side, which I fully agree with, the critical reception of the motion picture is still very positive and historian's consider the story very accurate on the major events. This brings me to Ridley Scott's 2000 picture "Gladiator" and another controversy. The basic story line is identical to the Bronston picture. Playing not Livius, but Maximus was Russell Crowe, playing Marcus Aurelius was Richard Harris, Lucilla was portrayed by Connie Nielsen and Joaquin Phoenix played Commodus. The initial controversy came from Screenwriter and Producer David Franzoni's screenplay. At the Press Previews and continuing into the film's release in both the United States and the U.K. The critics pointed out major similarities between "The Fall of the Roman Empire" and "Gladiator" going beyond using the same characters and events. Franzoni backed by Ridley Scott claimed to never have heard of the Samuel Bronston production. Possible as there was 36 years between the films. However, the critics pointed out that David Franzoni's written screenplay had many sequences with word for word dialogue from the 1964 production. His screenplay in some scenes included word for word the exact same movement instructions for the actors, placement for the cameras and lighting. Both Scott and Franzoni continue to state they never heard, nor saw "The Fall of the Roman Empire". I leave my reader to draw their own conclusions, if you are familiar with both pictures. "The Fall of the Roman Empire" wasn't the only big budgeted motion picture released in 1964 by "Samuel Bronston Productions". On June 25, 1964 audiences saw "Circus World" in the U.K. "The Magnificent Showman" starring John Wayne, Rita Hayworth and Claudia Cardinale. The movie was shown in the one camera Cinerama process. Compared to the other four "epics" "Circus World" had a modest budget estimated at 9 million dollars. I could not find the total box office, but on its initial release the picture grossed in the United States and Canada $1,550,000. The story is about Matt Masters who owns a combination Wild West/ Circus and takes it to tour Europe. He has been raising Toni the daughter of Trapeze artist Lili Alfredo and her deceased husband. Once in Europe Masters starts to search for the missing Lili. There is a dark secret here concerning the death of her husband and this starts to come out when his brother Aldo joins Masters' show. There is a certain tribute to the traveling Wild West Shows of Buffalo Bill Cody and the like in "Circus World". John Wayne performs an act where he shoots glass balls held up on sticks by circus performers as he rides on top of a stagecoach. This is very similar to the one Annie Oakley did for Buffalo Bill. Like the other Bronston produced films there was controversy and both David Niven and Director Frank Capra dropped out over the fact that John Wayne was having the script rewritten more for him. However, there is also a sad note to another part of the controversy. John Wayne had looked forward to working with Rita Hayward who portrayed Lili Alfredo, but according to film historians that turned sour as she would show up drunk on the set and retake after retake took place. It is believed though that Hayworth was attempting to hide the fact she was in the first stages of Alzheimer's disease. She would go on to nominated for Best Actress at the Golden Globe Awards. The image below almost cost John Wayne his life. The sequence of the circus burning is spectacular and Wayne insisted on no stunt man. However, somehow there was a mix up on getting John Wayne the cue to exit the scene, but luckily at the last moment he moved out of the way as the entire set collapsed upon the spot he was standing upon. As an aside this was the last film made by John Wayne before he was diagnosed with lung cancer. Q. Do you have any bank accounts in Swiss banks, Mr. Bronston? A. The company had an account there for about six months, in Zürich. Q. Have you any nominees who have bank accounts in Swiss banks? The above quote from his 1966 trial was submitted in "Bronston v. United States" argued on November 15, 1972 in the United States Supreme Court, The charge was that Samuel Bronston committed perjury with a misleading answer to the lawyer asking the question. It would be discovered that at the time of the bankruptcy filing resulting from the commercial failure of "The Fall of the Roman Empire" "Samuel Bronston Productions" maintained 37 different bank accounts in five different countries. However, the Supreme Court issued an unanimous opinion written by Chief Justice Warren Burger in Bronston's favor. Although the court admitted Samuel Bronston knew about the other four countries having bank accounts, The lawyer asked only about "Swiss banks" and failed to ask follow up questions about other possible accounts. A jury should not be permitted to engage in conjecture whether an unresponsive answer, true and complete on its face, was intended to mislead or divert the examiner; the state of mind of the witness is relevant only to the extent that it bears on whether "he does not believe [his answer] to be true." To hold otherwise would be to inject a new and confusing element into the adversary testimonial system we know. Witnesses would be unsure of the extent of their responsibility for the misunderstandings and inadequacies of examiners, and might well fear having that responsibility tested by a jury under the vague rubric of "intent to mislead" or "perjury by implication." One would think that after his bankruptcy and perjury trials Samuel Bronston would have retired from the motion picture business, but between 1966 and 1984 he was involved as a producer of five more motion pictures. One of these five in which Samuel Bronston did not receive screen credit is a favorite of mine. Most of my readers who enjoy Western movies would be familiar with the oft used story line of the Calvary commander holding his garrison together and fighting off a group of outlaws, or bandits. In 1966 Bronston co-produced "Pampa Salvaje (Savage Pampas)" which was that oft told story line with a twist. The film takes place in 1870's Argentina where it was filmed. It starred American actors Robert Taylor, Ron Randell, whose face your would recognize even if you didn't know his name.and featured Ty Hardin known mainly for the 1958 Warner Brothers Western series "Bronco". This is a solid "B" Western directed by Hugo Fregonese. Whose American films include Jack Palance in 1953's "Man in the Attic", a tale of Jack the Ripper, and 1958's "Harry Black and the Tiger" starring Stewart Granger and Barbara Rush. In 1994 Samuel Bronston died of pneumonia while suffering from Alzheimer's disease. He was living at the time in Sacramento, California. He was buried in Las Rozas de Madrid, Spain having lived a very fascinating life.